Each time a piece of music is rescued from obscurity and recorded or performed for a modern audience, one of the very first questions which springs to mind is whether it was worth the trouble. 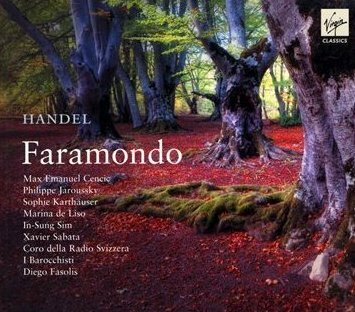 The answer in the present case of Handel's opera Faramondo is an unequivocal and enthusiastic 'yes'. Handel's operatic output is vast and spans most of his creative life, and many of the neglected works are receiving more attention in 2009, being the 250th anniversary of the composer's death. The assumption with the forgotten operas is often that they must be early, from before the composer had found his feet or reached his ultimate level of accomplishment. This is not the case with Faramondo however, which was premiered in 1738. This makes it very late in Handel's London opera career, with most of his triumphs in the genre already behind him. Faramondo was not a success at its premiere, despite Handel taking the trouble to have it published, and after the initial run of eight performances, it was never revived in his lifetime. Markus Cerenak, in his essay in the liner notes which accompany this release, quotes a contemporary source which implies current audience tastes had become rather low brow, and also speculates that the work's libretto impeded its success. A poor quality libretto is often posited as the reason for an opera's failure, but it is true of Faramondo that the story, which concerns warring factions, mistaken identity and complex and conflicted interpersonal relationships, is convoluted to the point where one runs out of energy before one has fully sorted out its intricacies in one's mind. This may well make it a tedious experience in the theatre, but the music is of such richness and quality that for the home listener, who can pick up the affect and emotional thrust of each aria without necessarily needing to know who is saying what to whom; it is an extremely rewarding work, particularly in the performance it receives on this recording. One aspect of the set which does help the dramatic clarity of the work is the fact that, perhaps unusually for modern, 'authentic' recordings of Handel's operas, all the female singers play women and, of course, all the male singers play men. This means we have countertenors singing castrato roles, a practice which is absolutely not authentic in terms of Handel performance practice. Nevertheless, the fact that we now have a crop of countertenors who sound as if they have undertaken serious study in good conservatoires, as opposed to stepped out of the Anglican choral tradition and had a go at opera, means we can accept them without having to make compromises. The stand out amongst the four countertenors on this recording is Max Emanuel Cencic who sings the title role. His voice is truly exceptional – clarion bright and comfortable in a slightly higher tessitura than that which suits most singers of his voice type. He sings with authority and excellent facility which allows him to match all the demands made of him by a role originally written for the famous castrato Caffarelli, but he is also more than capable of a pathos-laden legato line when called for, in arias such as 'Poi che pria di morire'. Philippe Jaroussky sings Adolfo, the lover of Faramondo's sister Clotilde, and his softer instrument with more inherent tenderness contrasts very well with Cencic's stentorian voice. Xaxier Sabata as Gernando, King of the Swabians, has an equally distinctive sound, again softer than Cencic's but darker and lower set than Jaroussky's. Terry Wey, as Childerico, the brother of Rosimonda, has very little to sing but his contribution is of a high quality consistent with the other singers. The soprano Sophie Karthäuser, who sings Clotilde, has a fresh, silvery soprano ideally suited to Handel, but it is nevertheless a pleasingly full sound. Rosimonda is sung by the mezzo soprano Marina de Liso, who has a rich, well extended voice with a lot of dark chocolate in the tone. The bass, In-Sung Sim impresses with his command of coloratura and comfort throughout the range. I Barocchisti, under the direction of Diego Fasolis, play with spirit, style and great accomplishment. The overture before Act I, and the sinfonias before Acts II and III are all highlights of the recording. The Coro della Radio Svizzera, Lugano, who have a little more to do than is often the case in Handel operas, are also excellent. Fasolis somehow manages to find the dance form at the root of each number and the appropriate tempo and sense of momentum flows forth, never more so than in the final, joyous Aria and Chorus, 'Virtù, che rende' where Cencic leads the forces in one of the most infections, exultant pieces of Handel I have come across, the crowning glory of a score of immense richness and variety that only leaves one wanting more.